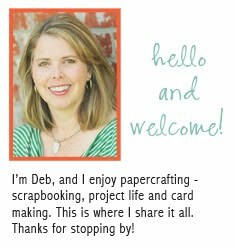 Today's card is mostly patterned paper and die cutting with just a little stamping. I used the MFT Circle Scribble stamps and matching dies, plus the scribbles dies, along with a "friend" word die for the sentiment. I used soft colors from My Mind's Eye patterned papers for the background papers and flower stems. 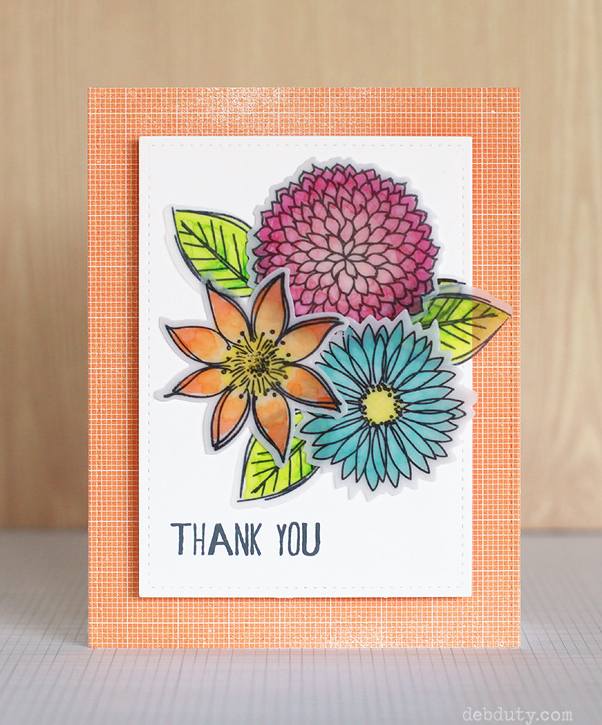 The flowers were stamped on watercolor paper with Studio Calico Color Theory inks in Glass Slipper and Coral Bay. I also cut the flowers scribbles out of watercolor paper. I used watercolor paper instead of regular cardstock because of its thickness and texture, and the off-white color of the watercolor paper coordinated nicely with the patterned papers. I cut three of the friend dies out of the watercolor paper to layer for an extra thick sentiment, and I colored the top one with Glass Slipper and Mint Hint Color Theory inks by pressing the inks on an acrylic block and using a wet paintbrush. I adhered the three words together with liquid glue. 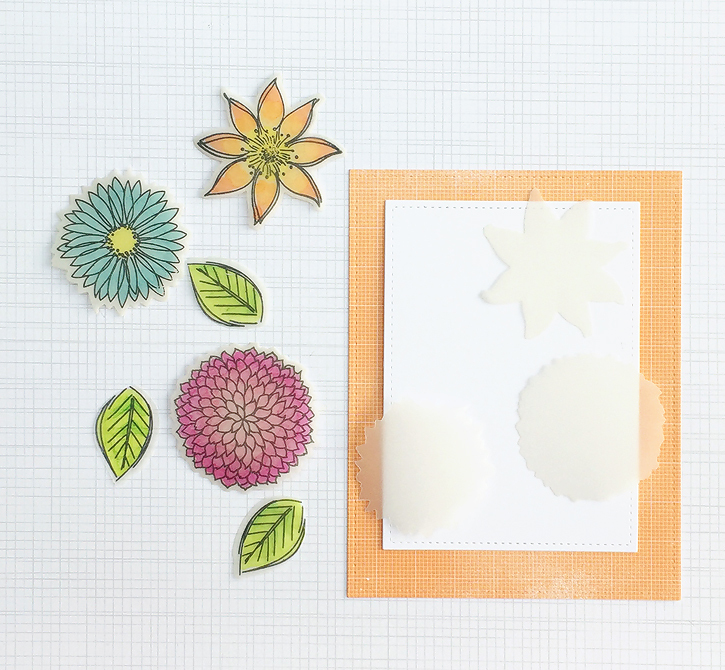 The stems and leaf were cut out of patterned paper with MFT dies. I cut some coral colored paper with a hill die and attached it to the tiny dot patterned paper that is 3 1/2" square. I attached the flowers and leaf with foam tape, the scribbles and sentiment with liquid glue and the stem with dot roller adhesive. The large dot paper is 5" square and attached to a card base the same size. The smaller panel was attached to the card front with foam tape. I added "hello" with tiny alpha stickers and to finish the card I stitched around the edges with my sewing machine. My card came together quickly and easily this time because I used a sketch! The sketch is from Retro Sketches, a challenge blog with a new sketch every Saturday. I'm linking up with Retro Sketches for the first time this week, and also with the Simon Monday challenge where the theme this week is pastels. 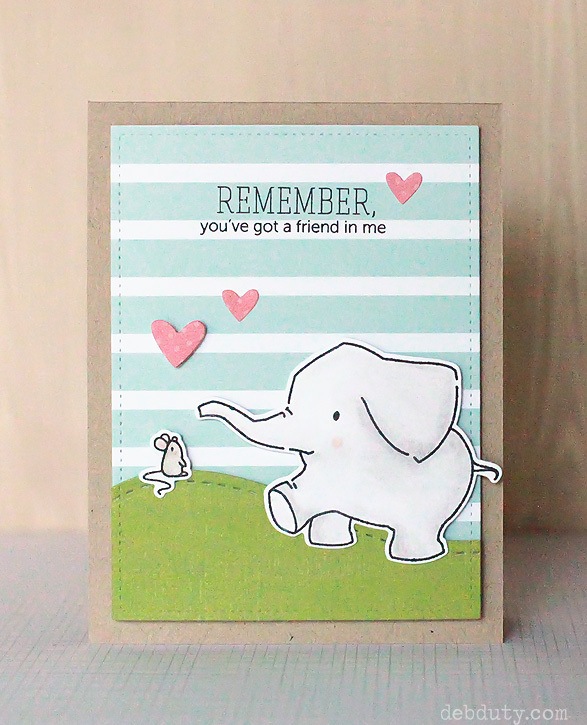 Today's card once again features Mama Elephant's lovely Freestyle Florals stamp set. 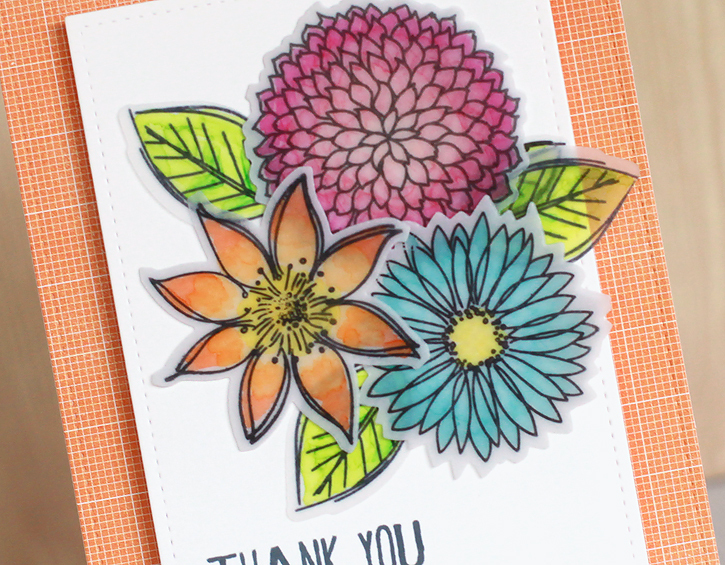 The flowers in this set are so pretty, and so much fun to color! I colored the flowers with copics again like last time, but this time I stamped the flowers on vellum for a different look. Here are the details on how I made this card. The base is a standard A2 top-fold card made of Neenah solar white 80 lb cardstock. I cut the orange patterned paper with a stitched rectangle die the same size as the card front, 5 1/2 x 4 1/4". I cut a another stitched rectangle out of the white cardstock for the front panel at 4 1/2 x 3 1/4". The flowers were stamped on vellum with memento ink. I don't care for stazon ink so I used memento ink and set it with my heat tool for a few seconds just to be sure it wouldn't smear. I cut the flowers out with the matching dies and I also cut extra flowers out of vellum to layer under the matching flowers on my card. I colored the flowers on the back side of the vellum with copic markers in the colors pictured below. I used two or three colors on each flower and leaf. 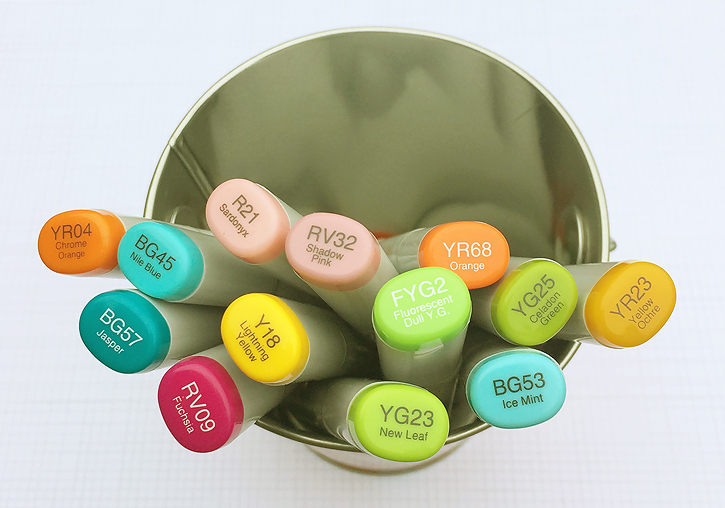 The colors don't blend together quite like they do on paper, but the result is really lovely. I layered the vellum shapes together with dot roller adhesive, and then onto the white panel with the same adhesive. The extra layer of vellum makes the colors more vibrant and helps to hide the adhesive. The sentiment is from the stamp set that came with this card kit (sold out), and I stamped it with Color Theory Gray Area ink. The white panel was adhered with foam tape, and the orange background with the dot roller. 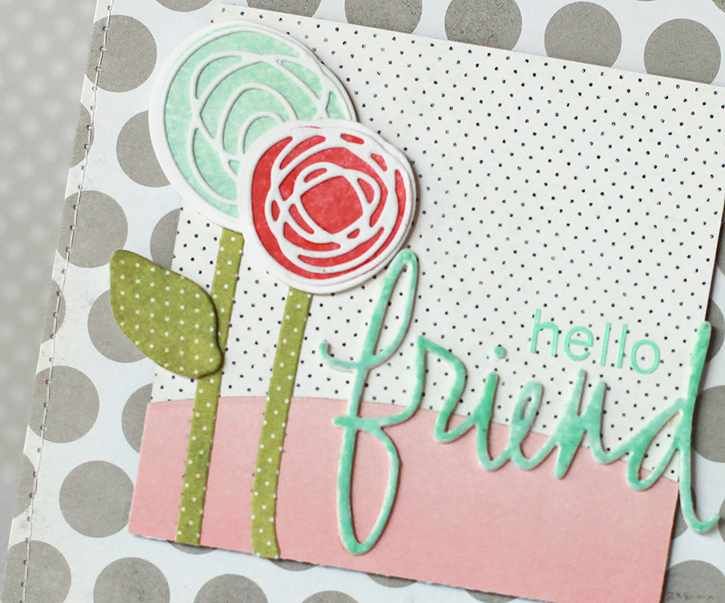 If you'd like to see another card with the Freestyle Florals stamp set, I shared one in this post. That's it for today. Hope you all have a lovely weekend! 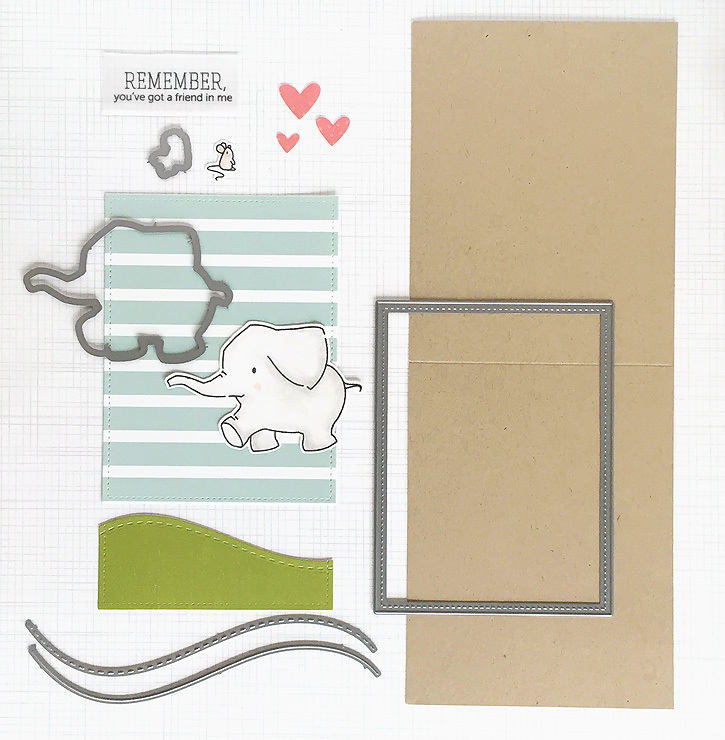 Today I'm sharing my second elephant card this week, but this time with Mama Elephant's Ella & Friends stamp set. This elephant is a little bigger than the WPlus9 elephant that I shared on cards here and here. I love that this stamp set has several other little animals as well like the little mouse. 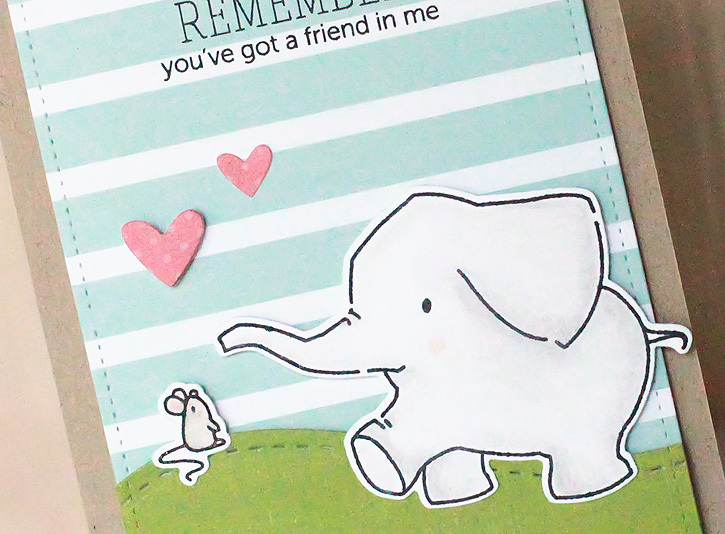 It makes a sweet card for a friend with the "Remember, you've got a friend in me" sentiment. This card base is a standard A2 size on kraft cardstock. I cut the blue striped paper with a stitched rectangle die at 5 x 3 3/4", and I cut the green paper with half of the same rectangle die, and then again with a hills border die. The elephant and the mouse were stamped with versamark ink and colored with prismacolor pencils. I colored the elephant with the lightest of the warm greys, and the mouse with the lightest of the french greys, and blended the pencil lines with the Prismacolor blender marker. Then I cut out the elephant and mouse with the matching dies. The hearts were cut from Lawn Fawn's heart dies. I stamped the sentiment first on vellum which made it easy to move around on the card to see where I wanted it, but I decided to stamp it directly on the striped paper. I used foam tape to adhere the grass, top of the elephant and mouse, the larger heart, and also the panel to the card base. Foam tape is my favorite dimensional adhesive because it's not as thick as foam dots. I like that the elements are only slightly raised. I used dot roller adhesive to adhere the bottoms of the elephant and mouse and the smaller hearts. I'm linking up today with the Simon Wednesday challenge. Check it out here for lots of inspiration!